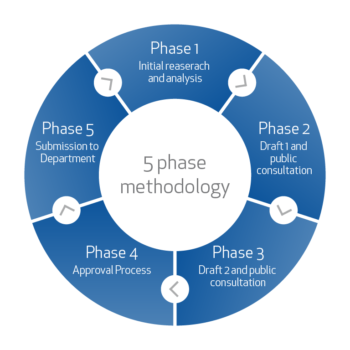 IBSA Manufacturing Training Development Projects follow the Training Package Development and Endorsement Process Policy and uses a five phase methodology. Our approach to all training package development work is to consider industry skills needs, Council of Australian Governments (COAG) Industry and Skills Council (CISC) priorities and 2012 Standards for Training Package Development. We investigate any opportunities to remove obsolete products, minimise duplication, provide more information on industry’s expectations of training delivery and support individuals to move more easily across occupations. Training Package Development Projects are overseen by the relevant Industry Reference Committee (IRC). The IRC establishes a project Technical Advisory Committee (TAC) to guide the project and provide industry expertise for the development of training package components. Establishment of a TAC to validate project scope and undertake a job role functional analysis. Develop first draft of training package components for feedback. Respond to feedback and develop second draft of training package components. Adjust training package components in response to further feedback and seek approval from respective committees and endorsement from state training authorities. Submit to the Department of Education and Training for AISC approval. Click here to view more information on Industry Reference Committees (IRCs), current projects and consultations, and additional SSO information.